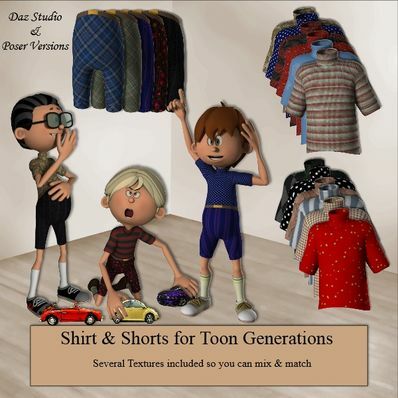 A Shirt & Shorts for Toon Generations for use in Daz Studio 4.6 and Poser. They have not been tested in Poser, although the cr2's do work in Daz Studio. Unzip and copy the runtime folders to your "My Library" folder. thanks for sharing. help a lot! Awesome, thank you for bringing them some very much needed new threads! Thank you so much. I'm looking forward to more for the ToonGens. Not alot available for these characters. Thanks much!